Our education system in this country is far too expensive and too time consuming. To earn a high school diploma, it takes 13 years at 7 hours a day for 180 days per year. This works out to 16,380 hours. 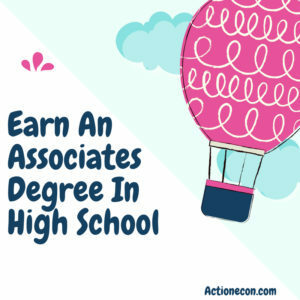 To earn an associates degree you are looking at another 2 years and 1,000 contact hours, and for a Bachelor’s degree you add ANOTHER 2 years and 1,000 contact hours. For most people, this means being stuck in the school system until they are 22. This system is inefficient, causes a massive opportunity cost, and is at the root of adults behaving like perpetual teenagers. Any opportunity that exists to break through this mold and finish school ahead of time is a good thing. This is why it makes sense for students to find ways to earn an Associates degree in high school. Many community colleges have programs with area high schools that incorporate taking college course while in high school. Some of these districts advertise these programs heavily, while others do not. In Southwest Michigan, Lake Michigan College (which I graduated from in 2006) provides several opportunities for area students to enroll in classes while in high school. In 2015 5 students in southwest Michigan earned an associates degrees in high school. In 2018 thanks in large part to the early middle college program detailed below 42 students graduated from high school and with their associates degree at the same time; what an amazing growth rate! These 42 students have given themselves an amazing head start in life. Dual Enrollment: With the dual enrollment program high school students take college courses on campus that count for both college credit and for high school credits. I took 1 dual enrollment course in high school as a compromise when I failed to negotiate graduating early at the end of the 1st semester my senior year. I had 2 high school classes in the morning and left the school at around 11 AM. I had 1 college course 1 night a week, which gave me credit for both high school and college. Had I tried harder and had the focus I am sure I could have taken another couple courses during the same time period. Another great aspect of dual enrollment is that the high school often pays for the classes at the college. Direct Credit: Direct Credit is another program that allows students to earn an associates degree in high school. The college works directly with the school district and teachers at the school are also accredited through the college. Without leaving the high school AP level students take courses that count for college credit as well as for their high school credit. A new program that Lake Michigan College has announced with area high schools creates a 5 year high school plan called early / middle college. During the students Junior and Senior years they take courses that result in college credit, and during the two years earn 30 credits. The high schools hold back on 1 high school credit, allowing the student to spend a fifth year in high school, which means he or she will not receive a high school diploma until 1 year later. This allows the high school to continue to receive the state funding of around $7,000 per student, which then pays for the college courses at Lake Michigan College, which they attend full time in the fifth year. The end result is a student ends up earning an associates degree 1 year early AND saving thousands on tuition. Overall this saves the student 1 year of schooling, and the entire cost of an associates degree. 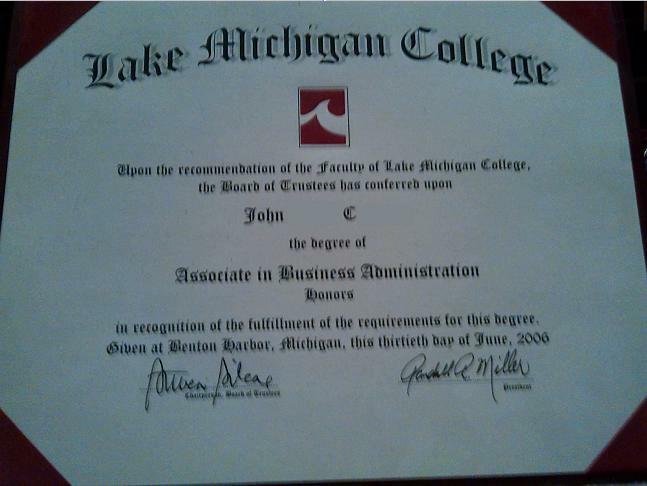 A full associates degree in tuition alone costs $8,500 at Lake Michigan College. In addition to saving the student money, he or she would save 1 year of time, which is huge. That is one year sooner the student can enter the workforce and start making some real money. This system also aligns the student’s interests and the schools interests. Without this program it is in the school districts best interest to hold students as long as possible. If they allow students who excel to graduate early, the school loses money. If 10% of a school’s students are capable of graduating a year early, then the school loses a large block of funding. This system allows the school to continue receiving funding, while allowing students who excel to move forward in life. What I don’t like about this model is that it keeps control with the high school and takes control away from the student. Any kid who has been able to pass all of his or her classes, still would have a risk of not being able to receive a HS Diploma. Let’s say a student enters the program and ends up not being able to complete the 5th year. Would the school still allow him to take the final class to graduate high school, even though he wasn’t able to finish the college program? I personally would prefer a system where students had the opportunity to graduate from high school 1 year early. Another problem with this is that this program is essentially an end run around the intent of K-12 funding. The per year $7,000 funding per student was designed solely to provide funds for K-12 education. In this situation those funds are going towards funding a college education instead of K-12. I love the creativity of this arrangement overall, but as a taxpayer I do think this is spending earmarked dollars in a way that was not intended. In the event that your school district and local community college do not have such a program set up, it may be possible to take college courses on your own while still in high school. Many community colleges have open door policies towards anyone who is interested. Classes are often held in the evening, on weekends, and during the summer, so it is possible to fit classes in around a high school schedule if need be. At Southwestern Michigan College their Early College enrollment form requires parent signatures for each individual course the student is taking for students between the ages of 13 and 15. Having community colleges that allow outstanding students to start taking college courses at earlier ages like this provides them with a major head start in life. CLEP (or College Level Exam Placement) exams are an excellent source of credits to allow a student to earn an associates degree in high school. With CLEP exams the student just has to pass the test and then will receive credit for the course. It is imperative that CLE exams are taken with the final college the student plans to attend in mind. Most colleges and Universities limit the number of credits a student may earn through CLEP to 15 or 30. Each college also assigned different levels of credit for different courses. Michigan State University may award 6 credits for one test, while The University of Michigan may offer none. 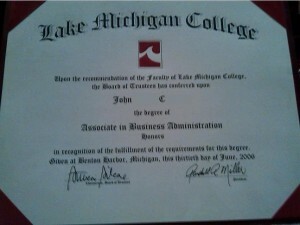 In order to graduate from college a bit earlier I took 1 CLEP exam which was worth 6 credits at Siena Heights University. I paid under $100 to take the test and I studied for around 1 week in order to pass it. If you want to earn an associates degree while still in High School don’t forget about CLEP Exams! There are currently 33 different CLEP exams available. The limiting factor in all of these programs is how ready the child in question is to handle college level coursework. It might not make sense for a particular child to start taking college courses at 13, but by 16 he or she could be perfectly ready. Any amount of college work done before hand can be a major boost down the road. One of the primary problems with a four year college degree is that it takes four years to get, four years in which the person earning it most likely is not fully engaged, and possibly not engaged at all in the workforce. This exacerbates the tuition and fees, room and board, and textbook costs, which quickly add up and can lead to excessive student loan debt. Earning an associates degree in high school, or at least SOME of an associates degree in high school can greatly reduce these problems. If you or your child has the opportunity to participate in any of these programs, I highly recommend it. Another great method to earning college credits ahead of time is taking CLEP exams. 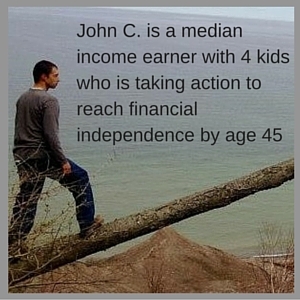 John C. started Action Economics in 2013 as a way to gain more knowledge on personal financial planning and to share that knowledge with others. Action Economics focuses on paying off the house, reducing taxes, and building wealth. John uses the free tool Personal Capital to track his net worth and posts quarterly updates on his finances. Check out the Action Economics archives section for all past posts. One Response to "Earn An Associates Degree In High School"
I wish these programs had been available when I was a kid. We had CLEP exams but my college did not accept them back in those days. I think this is a great way to save money and keep the smart kids engaged in learning.